Uber has teamed up with NASA to develop flying cars for passenger transport. Uber's planned "flying cars" will navigate crowded city skies with some help from NASA, if everything goes according to plan. 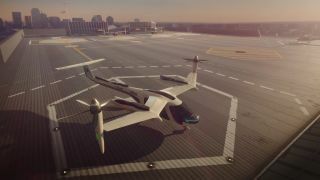 The space agency has signed an agreement with Uber to help develop an air-traffic-control system for the flying-car project, which goes by the name Uber Elevate or UberAir, according to USA Today. "UberAir will be performing far more flights over cities on a daily basis than has ever been done before," Uber Chief Product Officer Jeff Holden said in a statement provided to USA Today. "Doing this safely and efficiently is going to require a foundational change in airspace-management technologies." NASA has already been working to develop such technologies and help make "urban air mobility" (UAM) a reality, agency officials have said. In 2011, the agency's Aeronautics Research Mission Directorate (ARMD) started a project called Unmanned Aircraft Systems Integration in the National Airspace System (UAS in the NAS), which focused on relatively large, uncrewed vehicles flying above 500 feet (150 meters). Then, in 2015, NASA initiated its UAS Traffic Management (UTM) project, to deal with smaller, lower-flying drones. "We believe our job is to create opportunities for the UAM community to work together toward the common goal of safe, efficient and quiet operations," Rich Wahls, NASA's strategic technical advisor in the Advanced Air Vehicles Program for ARMD, said in a statement. "We have a unique role to play in leading collaborative efforts that leverage the knowledge, technologies and visions of everyone coming to the table," Wahls added. Uber said it hopes to begin flying its aerial taxis — basically, small planes with wing-mounted propellers that will take off and land vertically, on the roofs of buildings — by 2020. The company has announced three cities as the sites of this early push: Los Angeles, Dallas and Dubai, in the United Arab Emirates. Uber Elevate has other NASA connections as well. Earlier this year, Uber hired longtime NASA engineer Mark Moore to help develop the Elevate initiative.